Make regularly scheduled visits to the vet. One of the primary ways to keep your pet healthy is to bring them in to see us for regularly scheduled visits. Vet visits aren’t just for when your pet is sick; they’re also crucial to maintaining your pet’s health. When your pet gets a checkup, it’s an opportunity for us to examine them, provide preventative treatments like vaccines, and ensure that no health issues are lurking unseen below the surface. Obesity in pets can cause a host of health problems, including heart and kidney problems, diabetes, arthritis, and more. Many pets in North America are overweight, and it’s up to us to make sure that our pets stay slim, trim, and healthy! If your pet is overweight, come to talk to us about how much your pet should be eating for their size, and start using that measuring cup to control portions! Another diet-related way to extend your pet’s lifespan is through proper diet. Some pet foods offer a more balanced nutritional profile than others. Additionally, according to your pet’s age, they may have different dietary requirements. While we’re discussing portion size, we can also discuss with you what your dog should be eating to stay healthy. It’s impossible to completely remove all potential hazards from your house, and you’d probably go crazy if you tried. But there are some things you can do to keep your pets safe. Don’t keep toxic plants, like lilies, that are poisonous to your pets, and store harmful substances like anti-freeze, high and out of the reach of curious animals. Provide plenty of opportunities for exercise. Like humans, exercise is an essential part of a healthy lifestyle for pets. For dogs, make sure you are walking them regularly for an extended period of time, and taking the time to play games with them. For cats, exercise often comes during play time, whether that’s chasing a toy or solving a food puzzle for treats. Also like humans, pets need regular teeth cleanings or they may develop gum disease, which can lead to a host of other health problems. 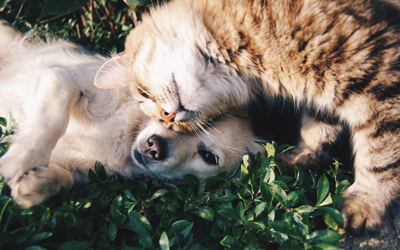 In addition to getting regular teeth cleanings from us, you should also be caring for your pet’s teeth at home. You can brush their teeth, using special pet-safe toothpaste (never use human toothpaste on your pet). If your pet is especially resistant to tooth brushing, you can also consider one of the various dental chews available on the market. Believe it or not, neutering or spaying your pet can be good for them. Neutering pets reduces or eliminates the risk of certain diseases, infections, and cancer. Training your dog isn’t just to improve their behavior in social situations or to make them work for their snacks. It can also be life-saving. Training your dog to listen and come on command can save them from running into the road after a squirrel or being attacked by a wild animal. With a little bit of effort, you can train your dog and ensure that they don’t engage in behaviors that could endanger their life. Indoor cats tend to have much longer lifespans than outdoor ones, simply because they encounter fewer life-threatening dangers. Outdoor cats are exposed to a whole host of risks, including other animals, the elements, potentially harmful diseases, and fast-moving vehicles. Keeping your cat indoors can help them avoid these dangers and extend their life.